Visits: 44173 persons viewed this recipe. 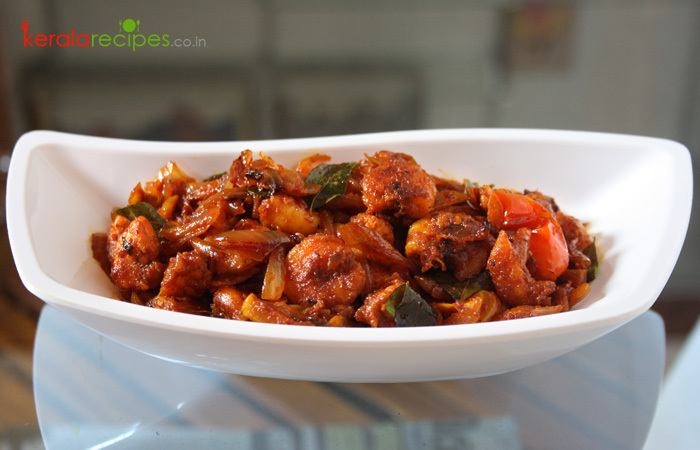 Prawns roast – a yummy non-veg side dish which goes well with rice, chappathi, idiyappam etc. The steps might seem long, but it is an easy to prepare dish. Here you go with the prawns roast recipe. Ginger-garlic paste, chilli powder (1 tea spoon) and turmeric powder should be made as paste by adding a little salt. Marinate prawns with the paste and keep for minimum 30 minutes. Slice onions, chop garlic and dice tomatoes. Heat 2 table spoon of cooking oil in a frying pan and shallow fry marinated prawns by turning both sides on a low heat. This will take about 8 minutes (cooking time may vary depends on the size of the prawns used). Heat remaining cooking oil (1 table spoon) in the same pan and put chopped garlic. Stir it for few seconds. Add sliced onions and salt. Saute it in medium heat until golden brown. Bring down the heat to low, add 2 tea spoon of chilli powder and stir it for 1 minute. To this, add tomatoes and curry leaves. Stir occasionally in a medium heat, until the tomatoes cooked well. When it is done, add fried prawns and combine well. Cook it in a low heat about 3 minutes by stirring occasionally. Prawns roast is ready, remove from the pan and serve hot. Adjust the level of spices to suit your taste. Really I was in search of a good Prawns Roast Recipe. Now I could find a good one, which is very clear and simple. Thanks a lot. Hi Vincent, I am also happy that you found what you are looking for long time. Thanks a lot for your kind words. You are welcome Danie Thanks a lot for the feedback. You are welcome Phons. Great to know that you all enjoyed it. Hope you will try other recipes too. Once again thanks for the feedback. Really a simply and wonderful recipe. Really very nice recipe with very simple steps. Soumya, Thanks for your kind words of encouragement and also for the feedback. Really tasty and Yummy recipe, Geo. Please post more fish and veg recipes. Sreelekshmi, Thanks for the feedback. I will try to post more fish and vegetarian recipes. Is it okay to boil the prawns before frying? I have been doing like that. That is fine Divya. Thanks for the comment. Hai Mr. Shaan Geo, I have heard of you shortly from the Madhyamam Ruchi. I am very interesting in cooking. Thanks a lot for the service. With regards, Mohd. Nazar, Alappuzha. You are welcome Mohammed Nazar. Glad to know that you heard about me from “Madhyamam Ruchi Magazine”. Hope you will try my recipes when time permits. Thanks a lot for visiting the website and also for the feedback. Nice and very good prawns roast. Shimna, Good to hear that you and your husband enjoyed this dish very much. Thanks a bunch for your kind words. Dear sir, I’m highly impressed by your recipes, looking forward to have a personnel talk with you, may I have your contact details for this aim, kindly deliver with to my mail. Which my pleasure to have your early response. Prasanna, It is pleasure to know that you like my recipes. You can contact me on my personal number which is given in the Contact page. It was really tasty Shaan. Waiting for karimeen mappas recipe. Thanks Suresh. Will post the mappas recipe soon. You are welcome Lakshmi. Glad to know that your daughter loves prawns dishes very much. I will try to add more prawns recipes shortly. Hope you tried prawns theeyal. Thanks for the feedback. Hi Shan. I tried out your prawn roast recipe the other day and it came out very well. The dish got over in no time. Prawn roast is different from the usual prawn preparations but it kept the original taste of the prawn. Yummy dish. Thanks for sharing the recipe. Minnu, Thanks you very much for trying this recipe and also for the feedback. Preetha, Thanks a lot for your good words of appreciation. I will try to post more recipes. Misna, Thanks for trying prawns roast recipe and also for the feedback. I will try to include more recipes when time permits. Hope to see you here often.